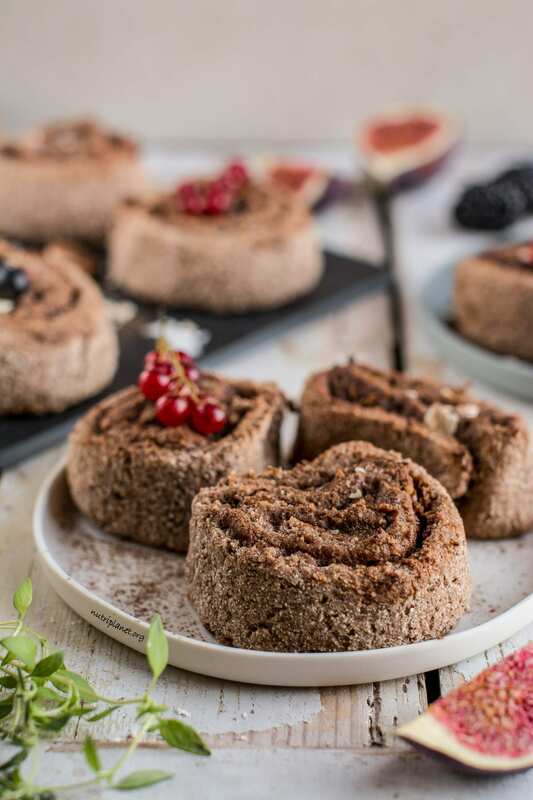 I give you mind blowing no yeast gluten-free vegan cinnamon rolls that you’ll definitely fall in love with. My recipe uses no refined sugar or vegan butter, but is yet so hearty, moist and filling. Don’t forget to watch the tutorial video! Scroll down! 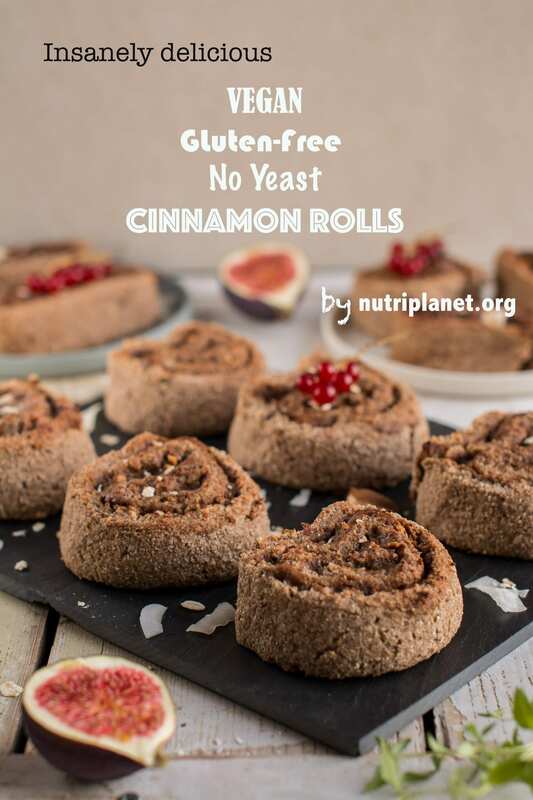 The story behind them is that I wanted to revamp my no yeast cinnamon rolls recipe that uses only grain-based flours and therefore has quite high glycemic load. So, in this recipe I decided to use half of oat flour and half coconut flour, which worked out really great. For the filling, I went for a lot more paste-like option (compared to my previous recipe). As you know, I don’t do dried fruits, so I’m using quite a lot of nut butter for this absolutely insane cinnamon roll filling. The filling ingredients are right here! 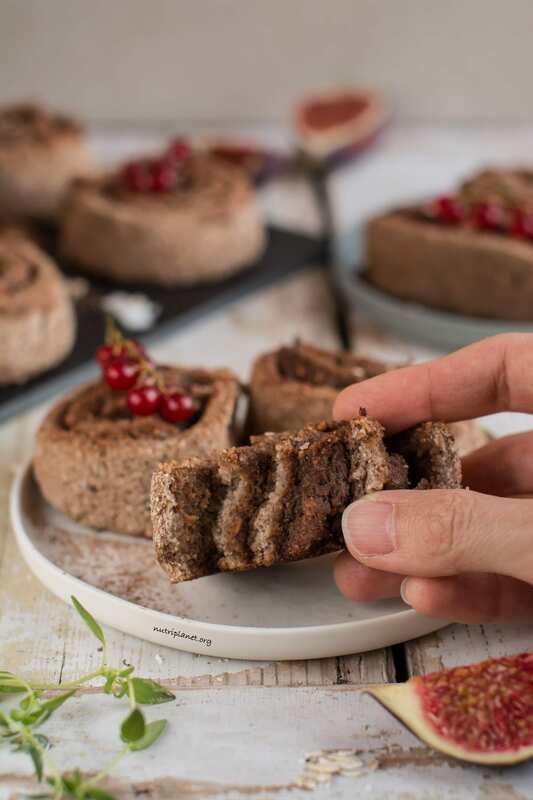 When I first bit into this cinnamon bun I was literally blown away – it was just so perfectly soft, moist, hearty and full of flavour! In addition, my kitchen was filled with heavenly smell of cinnamon and vanilla. 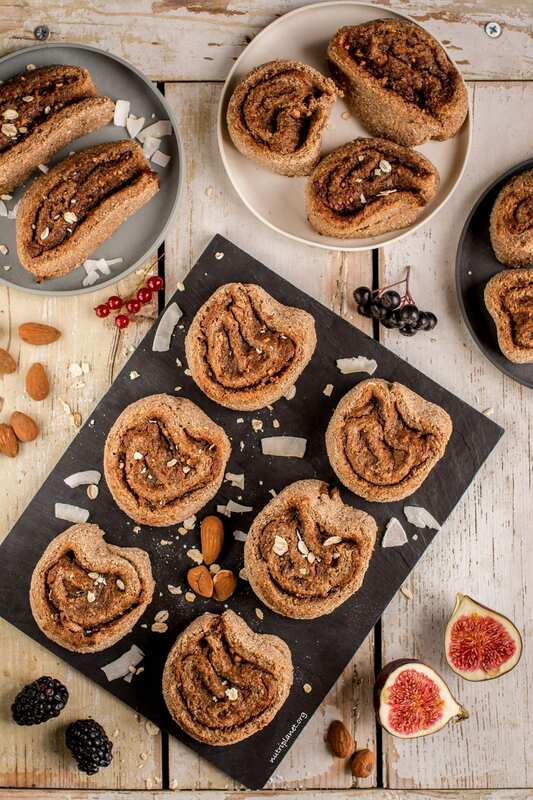 I’m sure you’ll find it equally hard not to eat those cinnamon rolls raw! As an illustration of this recipe’s success, it must be said that my husband and kid were munching away and couldn’t wait for another batch. And what’s more, even my mother was over the moon when I offered her my cinnamon roll. Evidently she didn’t keep it to one piece and confirmed how filling they were. I can’t wait for you to try this recipe out! Definitely let me know in comments or tag me in social media when you’ve made it. First, mix psyllium husks with water and let sit for about 10 minutes. In a separate bowl, do the same with soymilk and apple cider vinegar. In a large bowl, mix together flours, salt, cinnamon, baking powder and vanilla. Next, dissolve xylitol and stevia in soymilk/ACV mixture. Pour the wet mixtures onto the dry ingredients and form a dough ball. It’s the easiest to use spatula. Refrigerate the dough for about 30 minutes. You can also leave it in refrigerator overnight. Mix all ingredients in a bowl. 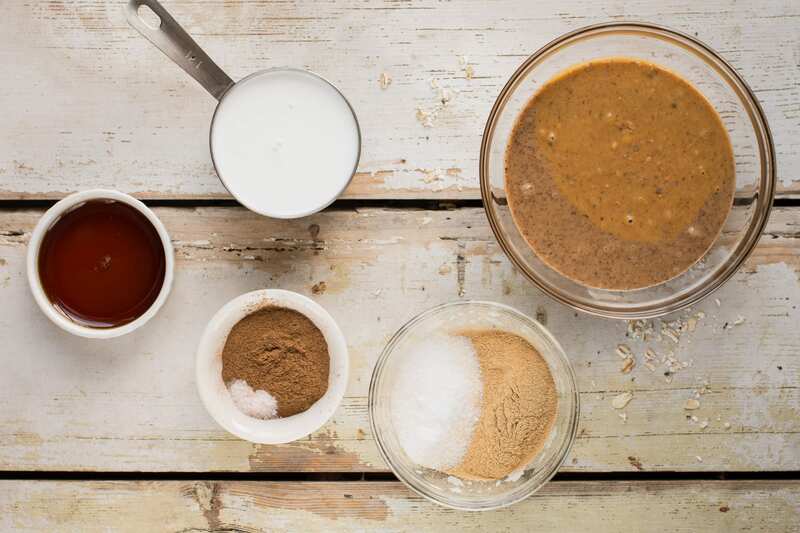 Add coconut milk gradually as the final amount depends on the consistency of your nut butter. You may need to add more if your butter is very thick. See the right consistency from video below. Let the mixture settle for about 5 minutes as the mesquite absorbs liquid. 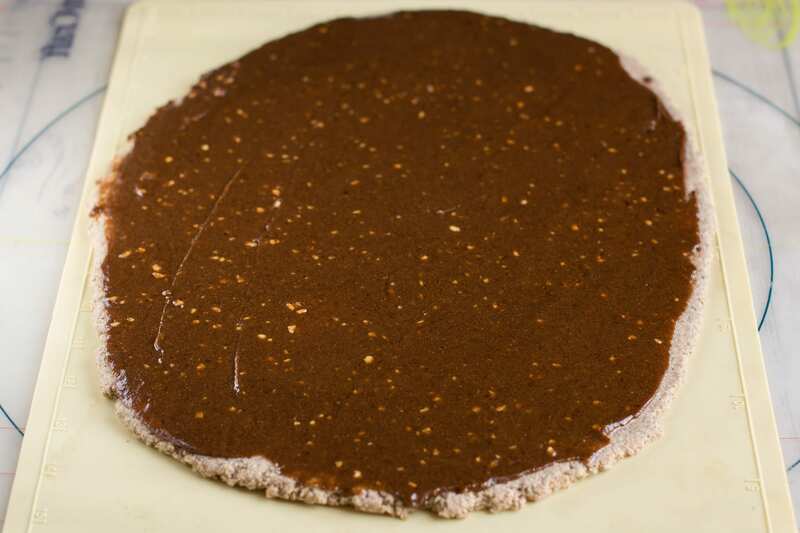 Take a silicone mat, wax paper or non-stick parchment paper and place your dough ball in the middle. Now, put another piece of parchment or wax paper on top of the dough and start rolling. Roll the dough out into about 28×35 cm (11×13.8 inch) rectangle and remove the parchment paper. Next, using a small spatula spread the filling evenly onto the dough. Then, slowly roll the dough into a tight spiral releasing the silicone mat as you progress. Check the video below! Slice the dough log into 9-10 rolls and place them on baking sheet lined with parchment paper or use the same silicone mat you rolled the dough on. Shape them a bit if needed. Finally, bake the rolls at 200°C (390°F) for about 25 minutes until golden brown. Let cool a bit before eating. My vegan cinnamon rolls go extremely well with Caramel Sauce or Quick Chocolate Sauce. 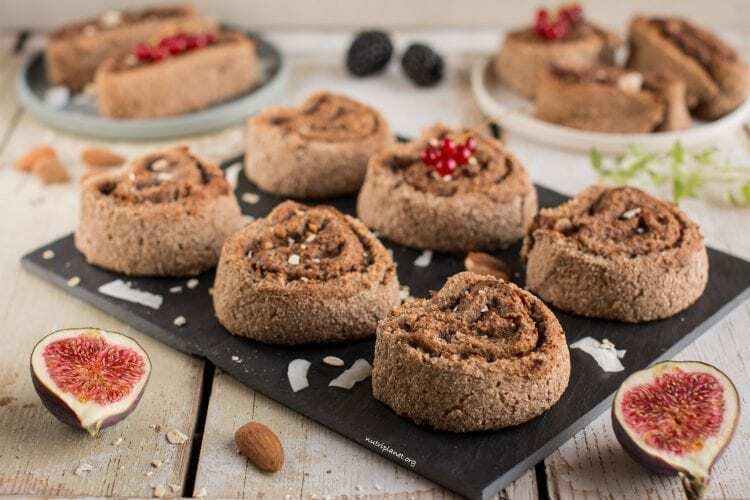 Nutritional info per cinnamon bun: 198 kcal, 13.6g carbohydrates (48.2% of kcal), 10.6g fats (48.3% of kcal), 7.85g protein (15.9g of kcal), 8.27g fibre, and 5.8 GL points. Grind your own oat flour – measure 100 grams of gluten-free oats and process them in a blender or in a grinder. You can use any nut flour instead of coconut flour. However, make sure to use protein powders or reduced fat versions as ground nuts would simply be too heavy. Also, be aware that some flours may absorb more water than others. Almond milk can be used instead of soymilk – I’ve tried it myself and it works equally well. If you don’t have problems with Candida overgrowth or unstable blood sugar, use any sweetener you like, e.g. raw cane sugar, coconut sugar, palm sugar. For those on Candida cleanse, coconut nectar or agave can also be substituted. Just add a bit more of xylitol or stevia to the filling. Also, add one more tablespoon of coconut milk if you use granulated sugar substitute instead of liquid one. Mesquite powder gives the filling this nice caramel taste. Should you not be able to get it, try Peruvian carob or even regular carob powder (although the latter does not taste like caramel). As mesquite also adds mass and acts as thickener, you can’t just leave it out without substitution.